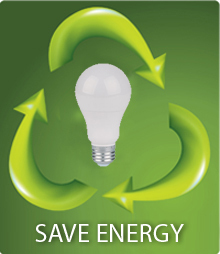 Replace standard incandescent light bulbs with LED bulb and save up to 80% of lighting costs. Using LEDs would save you on labor cost on replacement as it lasts 8-12 times longer than conventional bulbs. Always buy ENERGY STAR qualified LEDs & appliances, as they save more & lasts more. All Energy Star LED are tested under strict conditions to perform. Turn off unnecessary lighting, when not needed or before leaving the room. Use task lighting; instead of brightly lighting an entire room, focus the light where you need it. For example, use fluorescent under-cabinet lighting for kitchen sinks and counter. Disconnect or remove lamps in multiple lamp fixtures. Use task lighting where needed. Use up to 80% less in lighting energy. Make sure you are getting the best possible light by cleaning fixtures and replacing any yellowed or hazy lenses and diffusers at least once every year. Open blinds and shades. Turn off lights in unoccupied areas or in spaces with sufficient natural lighting. Turn off the lights when not needed. It is a myth that leaving them on uses less energy than turning them off. Turn off signage and other lights not necessary for security and safety. Rooms that have several kinds of lights — i.e. overhead and counter lights in a kitchen — should have separate switches for the various types. A three-level switch on table and floor lamps is an easy way to use one fixture for several lighting needs. Use 3 Way LED on such Table/ Floor lamps to enhance energy saving.